Chamorro speakers on Guam are dwindling. 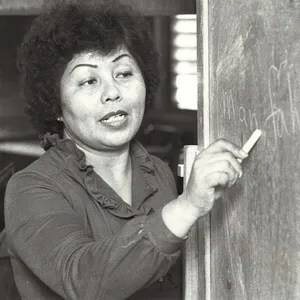 “I speak Chamorro and I want my children and husband, all born here, to also know how to speak the language. We’re hoping to close the gap,” Kayla Lujan-Espinosa, 27, said as she cradles her 3-week-old child and looks after her 4-year-old son at a community presentation on a draft master plan for a Chamorro immersion school program. She and her husband Rufo, 30, have three young children they want to understand and speak Chamorro. The Lujan-Espinosa family is one of many whose members are born and raised in Guam, yet many of them don’t understand, much less speak, Chamorro. “From 1990 to present, we probably lost about 10,000 Chamorro speakers,” said Jimmy S. Teria, school program consultant with the Guam Department of Education’s Chamorro Studies and Special Projects Division. “When I heard about a proposal to have a Chamorro immersion school program, I thought this will help my family learn the language,” said Kayla Lujan-Espinosa, who’s originally from Saipan, a teacher at Talofofo Elementary School. Despite their busy schedule, the family took the time to attend a presentation Wednesday at the Yona/Talofofo Senior Citizens Center in Talofofo on a draft Chamorro Immersion Master Plan developed by the Guam Department of Education’s Chamorro Studies and Special Projects Division. The draft plan is available for public review, input and participation. Most Chamorro speakers, Teria said, are over age 55, so they are considered a part of the older population. 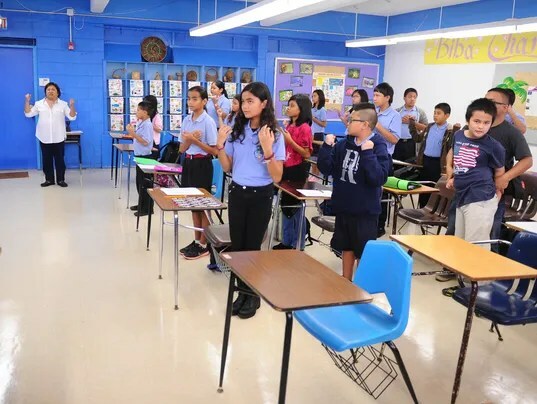 “We haven’t created a new generation of speakers,” said Teria, one of the leading proponents of a community-driven Chamorro language immersion school program. He said the program would complement existing Chamorro language programs on the island. Teria said the data is based from the U.S. Census of 1990, 2000 and 2010, which show the number of Chamorro speakers declining from 34,598 to 25,827. He said between 2010 and 2016, thousands more have been lost, bringing the estimate to 10,000. “According to statistics, if you don’t have a younger generation speaking the language, your language is endangered. It’s very endangered at this point,” he said. Teria also cited the results of a survey done by Pa’a Taotao Tano in 2010. “There is an indication from the data that the under-18 group struggles the most with the Chamorro language in overall comprehension,” Teria said. 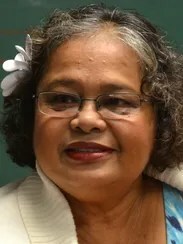 Rosa Salas Palomo, another proponent of a language immersion program and chairwoman of the Guam Academy Charter School Council, said the time is now to slow down or reverse the decline in the number of Chamorro speakers. She said community involvement is a key factor in making this happen. The draft plan, according to Teria, resulted from a community survey completed in March 2016 to gauge interest in a Chamorro language immersion program. There were 164 unique respondents and 88 of those agreed or strongly agreed that they would enroll their children at a school where only Chamorro is used for teaching, learning and socializing. Teria is encouraging families, individuals and groups interested in reviewing or providing input to the draft plan, or learn more about the proposed program, to contact him at 300-5048 or 483-3713. Tags: fino' chamoru, immersion, sinipok. Bookmark the permalink.